I write to thank you for your Floodguards products, and the peace of mind that they have afforded my family and I. We have four air brick guards and a door guard which is fitted to the rear access door of my garage. Over the last five years we have suffered fifteen floods, where raw sewage has reached depths of some eighteen inches around our property. Prior to your products being installed, the sewage entered our garage and breached the air bricks, causing considerable damage and a great deal of distress. The photographs below illustrate the conditions we suffer, and how ineffective sandbags are. 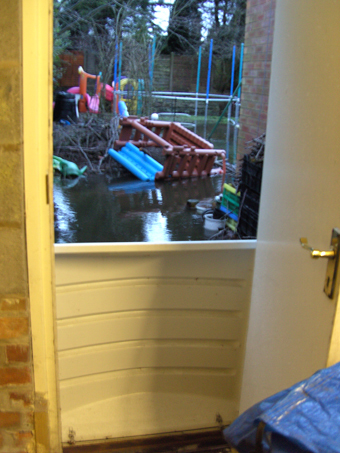 The door guard has prevented all ingress of sewage to the rear of the garage as we leave that in-situ all of the time. When installed, the air brick covers similarly prove to be 100% watertight. We cannot, however leave these installed all of the time, but fit them when we anticipate particularly bad weather. We have recently had another flood event and once again the guards have protected our property as can be seen from the pictures below. I cannot stress enough the peace of mind these products give. 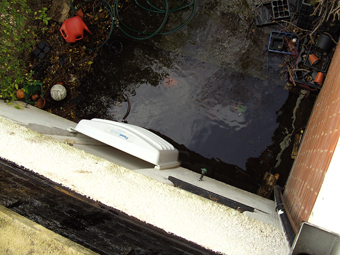 Cleaning up the exterior of a property is an order of magnitude less distressing than cleaning sewage from within.